This is a set of six 8″ diameter collectors bone china plates that is a limited production run of ONLY 144 making them a very rare collectible. Produced in 2007, this is the first release of plates produced for the hit Sci-Fi Channel TV Series Stargate Atlantis, a spin-offof the hit series Stargate SG-1. Only produced as matched numbered sets, this plate set contains the five main characters of Sheppard, Teyla, Mckay, Weir and Ronon on their own plates as well as a cast plate with them plus Doctor Beckett. 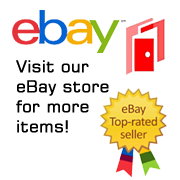 They were issued without paper certificates with the COA number of the set on both the back of the plate and on the sturdy cardboard box they are packed in. This is a set of six 8″ diameter collectors bone china plates that is a limited production run of ONLY 144 making them a very rare collectible. Produced in 2007, this is the first release of plates produced for the hit Sci-Fi Channel TV Series Stargate Atlantis, a spin-offof the hit series Stargate SG-1. 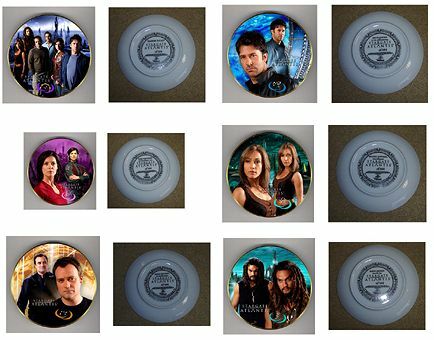 Only produced as matched numbered sets, this plate set contains the five main characters of Sheppard, Teyla, Mckay, Weir and Ronon on their own plates as well as a cast plate with them plus Doctor Beckett. They were issued without paper certificates with the COA number of the set on both the back of the plate and on the sturdy cardboard box they are packed in. They are new, never used plates, long sold out. It has been stored in a smoke and pet free environment.